So, I made blondies. 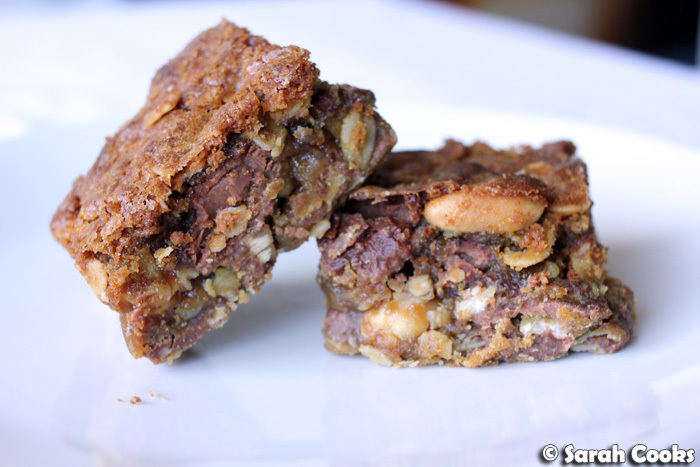 I filled them with big chunks of my favourite milk chocolate, oats, and salted peanuts. They were amazing. The day I baked them they were like warm, gooey, underbaked choc chip cookies. After a night in the fridge they were even better, just like a caramelly Snickers bar. They were intense and rich, with an almost obscene amount of butter, but hot damn they were good! I've made blondies a couple of times in the past - Nigella's white chocolate and macadamia 'brownies' from How to be a Domestic Goddess, and her blondies from Kitchen (not blogged) - but neither particularly impressed me. The former were more like a dense eggy cake, and the latter were overly sweet, with a bizarre texture. 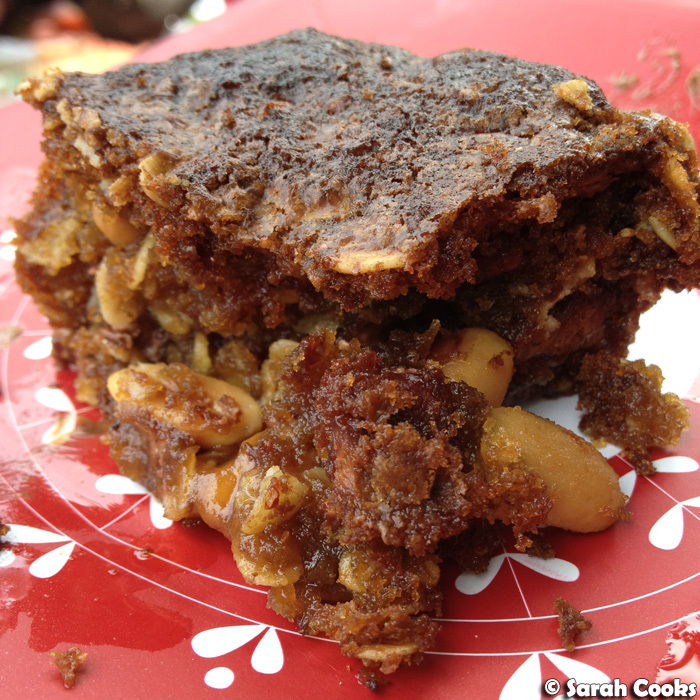 I couldn't resist changing it up quite a bit - I used dark brown sugar for an extra caramelly taste, cut down the flour for extra fudginess, added oats for texture (let's not kid ourselves and say it was for health purposes!) and used salted peanuts and Lindt milk chocolate for the add-ins. 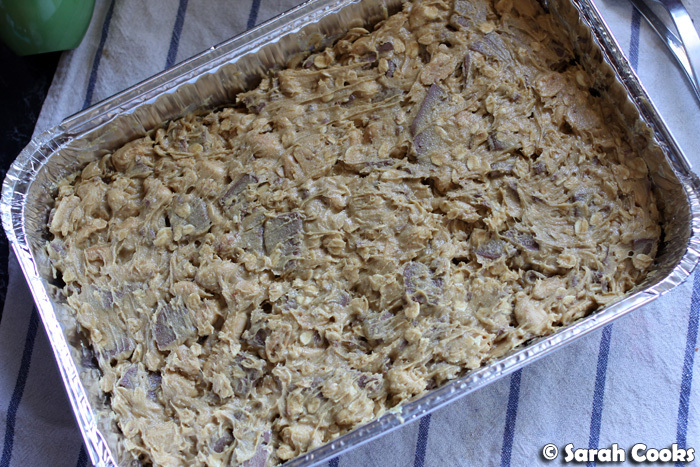 And thus my salted peanut and milk chocolate chunk blondies were born. 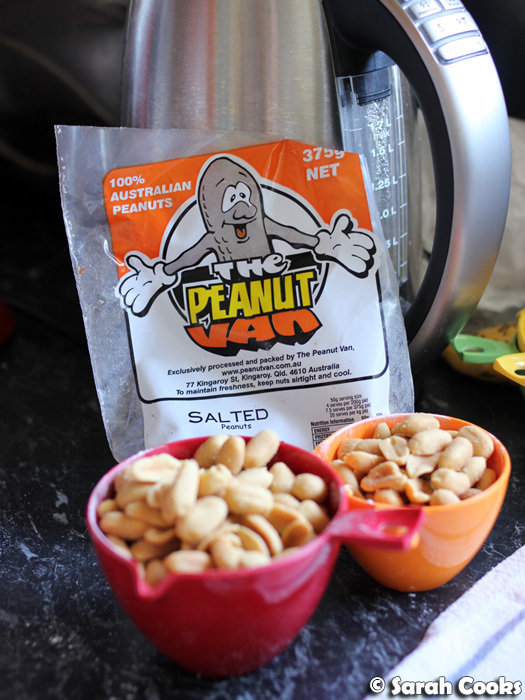 The peanuts I used were these fab salted peanuts that my friend Alaina brought all the way from Kingaroy in Queensland. They're so good - it was hard not eating them all before I started baking! I made these in a foil tray, as I was taking them to a picnic later that day and knew would be easier to transport. They rise up quite a bit during baking, but sink down upon cooling. 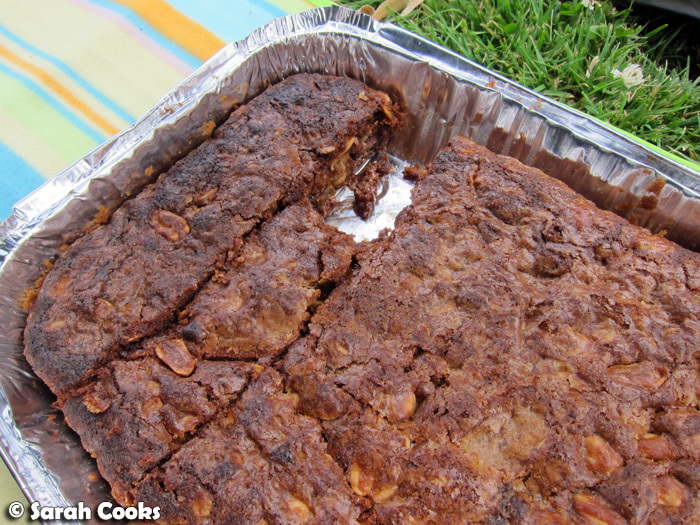 Even a few hours after coming out of the even, they were still mega-gooey and messy, but very, very tasty. 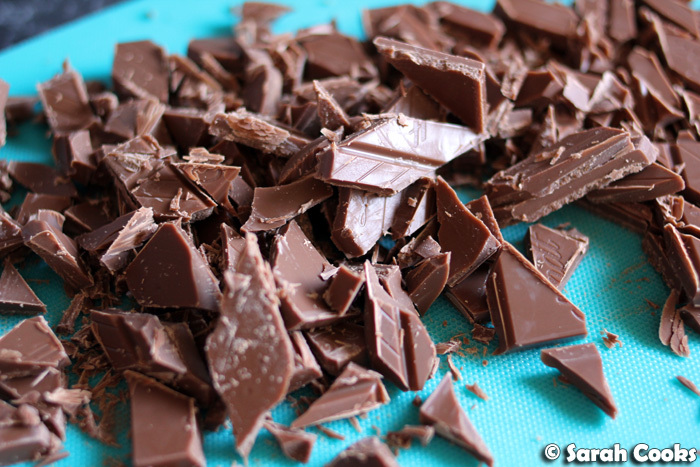 Ideally you'd let these cool completely before cutting them into squares, so that the chocolate has a chance to resolidify and you can get neat slices. Hah! As if I was going to wait that long! Do as I say, not as I do. Using an electric mixer, cream the butter and sugars until well combined, light and fluffy. Add the vanilla extract, then the eggs, one at a time, and beat until combined. Scrape down the sides of the bowl as necessary. Remove the bowl from the mixer. Sift over the flour, baking soda and salt. Add the oats to the bowl, and mix gently with a wooden spoon until combined, with no streaks of flour. 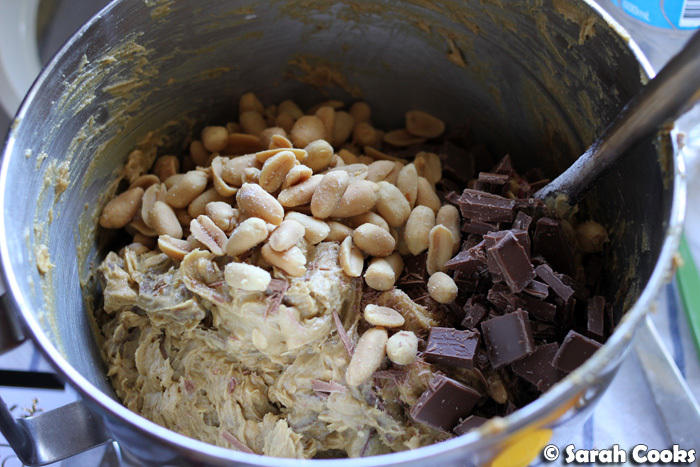 Fold in the salted peanuts and chocolate chunks. 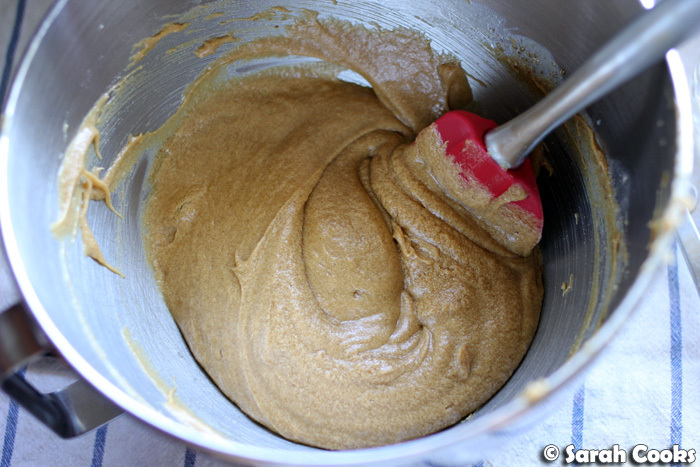 Spread the batter into the baking tray, and smooth the top down with a wooden spoon or spatula. Bake for 30 minutes, or until golden brown and more-or-less set. (It should be squidgy, so don't be alarmed if it looks a bit soft and a cake tester doesn't come out clean - it will firm up as it cools down and the chocolate solidifies). Allow to cool completely (or for as long as you can bear!) before cutting into small squares and removing from the tin. 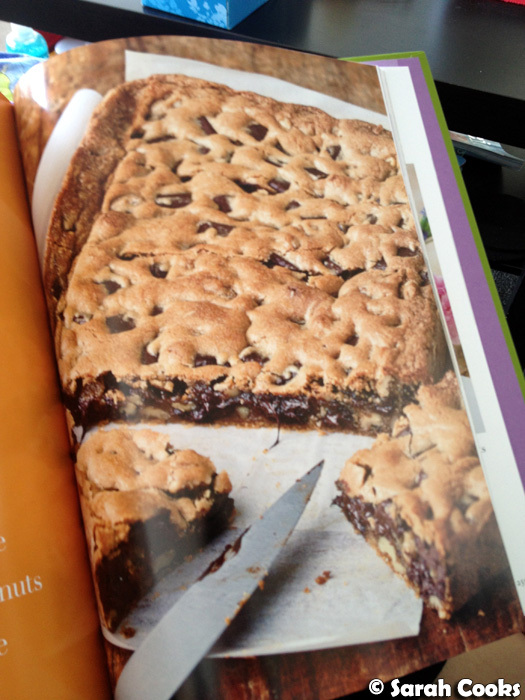 Wow there is a lot of chocolate in those blondies! :O Not that I'm complaining-I look at it as a good thing! 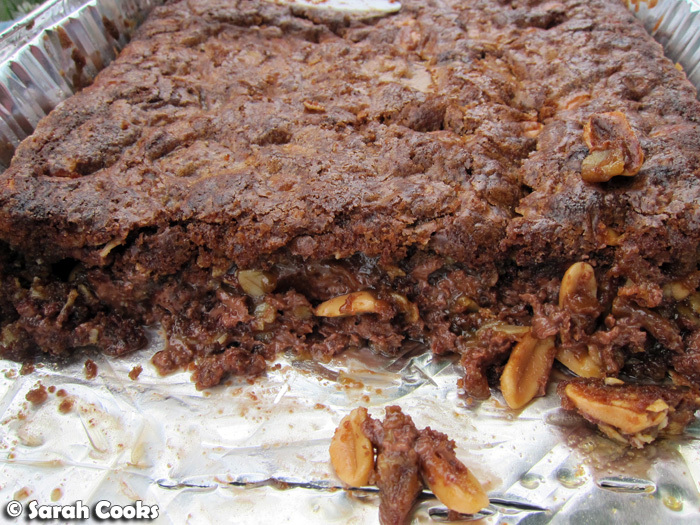 Lovely recipe :) I've never tried putting oats in brownies, but this recipe will definitely change my view on the diversity that this great dessert has :) ! Oh the gooeyness :) it looks sooo good! Oh my... these look incredible! Wow! Blondies and chocolates! I can hear my sweet tooth calling me again! It looks so good!